HOLIDAY ORDER CUT OFF DATE IS DEC 8TH 50 Screw on Climbing Holds Without Hardware. Rocky Mountain Gear Screw On Holds come Without Hardware. 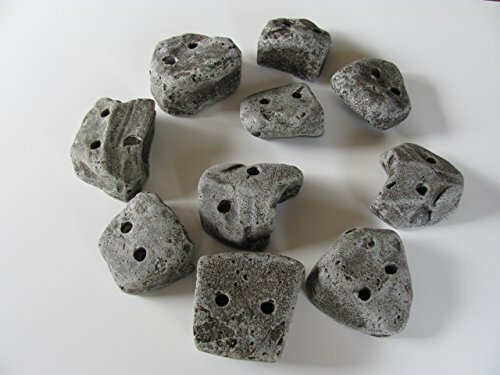 Weather proof, Realistic Rock Like Feel, Rocky Mountain Climbing Holds can be used for Personal or Commercial Use. Popular with Scouts, Schools, and Parents. Please Read Description. Holds are approximately the size of a baseball. The diameter of the hole in these holds is 1/4" Holds require use of #10 Wood Screws, at least 2 inches long. These holds are meant to be used with wood that is 1 1/2 inches thick. (Please look at our "bolt on" holds for plywood 3/4s- 1" thick ) PLEASE NOTE: Hardware is not included in our screw on sets. We make our climbing holds from recycled materials. What are they made of? Recycled materials including polyurethane, Vinyl Ester, Polyester, Plastics, Epoxy, Vegetable oil and other organic materials. Our materials are non-toxic. We make them in the United States, they are shipped from our shop directly to you. The bonding materials that we use may create a smell with the holds. To get rid of the smell please soak in warm water. These holds are NONTOXIC. Our holds are very strong and will stand up to any climate, hot or cold. Holds come in over 200 different unique shapes. If you need anything at all please do not hesitate to contact us. We are VERY responsive to messages through Amazon, and will happily help you with any issue. Email us on Amazon or call Rocky Mountain Climbing Gear (208) 704-0291 We Use USPS Only These holds come with a lifetime guarantee. Return policy is 60 day $5 restock fee applied. Rocky Mountain Climbing Gear is a trademarked company. If you wish to resell our products please contact us first, please do not re use our images or text. 50 Large Screw on Rock Climbing Holds. Realistic rock like feel and texture. Made from recycled materials. Popular with boyscouts, military, gyms and parents. Withstands outdoor use in all climates. 100% American Made Lifetime Guarantee! Part Number: 50 Large Kids Rock Climbing Holds. MPN: 50 Large Kids Rock Climbing Holds. If you have any questions about this product by Rocky Mountain Climbing Gear, contact us by completing and submitting the form below. If you are looking for a specif part number, please include it with your message.